Several years ago there was much discussion on Climate Audit and elsewhere regarding the anomalous ‘hump’ in sea surface temperatures during the wartime years in the 1940’s. The argument advanced was that various issues around the prevalence in those years of measurements from American warships which had changed over from using the time honoured technique of chucking a bucket on a rope over the side to get a sample, to using temperature sensors attached to the engine cooling intake pipe. It’s thought that heat conducted along the pipe from the engine might have skewed the readings to the warm side, and that this explains the big ‘hump’ in SST around the last war years. There is likely some truth in this, but I think there may be a conflation of two effects, and that we shouldn’t be hasty in ‘adjusting’ the 1940’s temperature downwards, for several reasons. Firstly, there is motivation in this. The ‘hump’ is problematic for the AGW theory. The ‘hump’ forms the tail end of the 1915-1945 warming period which rivals the modern warm period in length, strength and slope. But CO2 hadn’t been rising significantly during the period according to the Antarctic ice cores. They’d rather we didn’t think about it. > Can you delete any emails you may have had with Keith re AR4? > Keith will do likewise. He’s not in at the moment – minor family crisis. > have his new email address. > We will be getting Caspar to do likewise. The ‘Nature paper’ in question is By Thompson et al. The MET Office conducted a comprehensive investigation as a result. And here is the newly fudged HADsstV3GL against the old HADsstV2GL. In all of this though, I think something has been missed. It has been a recurrent theme on this blog in our investigations of the relationship between the solar cycle and ENSO. 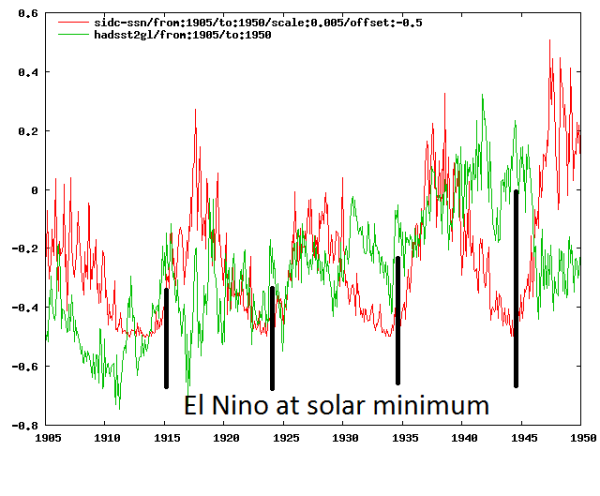 Big El Nino’s tend to occur at or just following solar minimum. Smaller El Nino’s tend to occur on the downslope of the cycle. 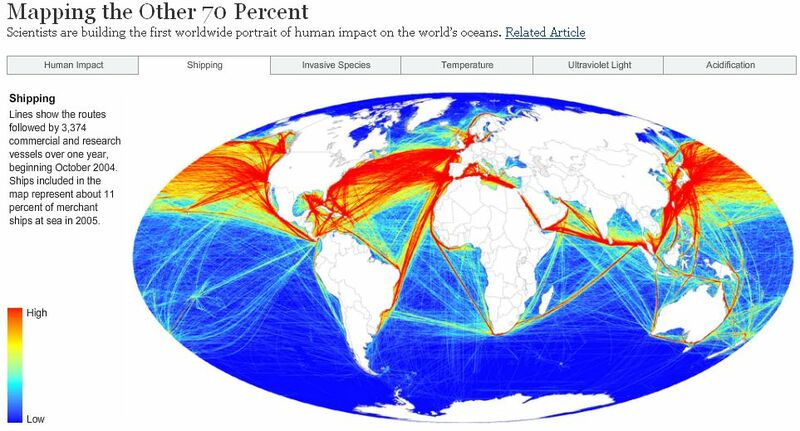 This is because there is an opportunity for the ocean to release energy as the sun weakens. As usual with nature’s ways, the magnitude isn’t equal every time, but the effect is real as you can see from the plots below which use the old HADsstV2GL rather than the V3 which has replaced it. As you can see, the 1940’s didn’t just get an El Nino at solar minimum, but a big El Nino on the downslope of the solar cycle too. With no La Nina between. But how can we verify this is real and not due to measurement error? Inconveniently (for us), the NOAA list of El Nino years starts in 1950. GGWeather.com has what it calls “A consensus list of El Nino years“. That starts in 1950 as well. Is this because the war interrupted measurements of sea level pressure at Darwin and Tahiti? No, the Queensland government has a list going much further back, to 1890, and they list 1940, 1941 and 1946 as El Nino years. Here’s a list I’ve drawn from it of all the El nino years and their strength (the more negative the stronger). So there there was a cluster of strong to medium El Nino events in the Early to mid 40’s. How strong were the La Nina events between? Answer, there was only one weak La Nina in the entire decade. So not only do we need to be concerned with the peaks in the temperature record of the El Nino events, but the lack of troughs from La Nina events which didn’t happen. The 1940’s ‘hump’ is real, and not so much affected by measurement techniques as recently claimed, and this is important, for the following reason. discover the 1945 problem in the Nature paper!! Good work on ElNino ! A fascinating read (and a good link from Vukcevic). As always when reading this type of thing as a scientific layman, I am always left flabbergasted that ‘THEY’ keep on getting away with their devious antics. When are proper, honest scientists going to call them out ? Slightly off topic but Michael Mann was mentioned so Talkshop readers may like to know that Mark Steyn, under threat of a lawsuit from Mann, is anxious that Mann does not get cold feet and back off. So he is now openly goading Mann. The latest bit of taunting is as follows. It’s the hump in atmospheric CO2 that’s the real news to me here. Thank you to bringing this to the light Tallbloke. I’m probably not alone in knowing very little of the measurements pre-Mauna Loa. I look forward to learning more of Beck. If temperature drives CO2 then of course one can hear the positive feedback arguments – except the 20th century data shows no sign of such an unstable system. All we know of 4 billion years doesn’t either. Once again one is struck by how little we know of anything. But this seems an important addition. The fact the Team wanted to suppress it is again one of the best pointers. What a shower. http://www.biomind.de/realCO2/ and represent direct wet-chemical measurements of atmospheric CO2 which cannot be simply wished away entire, as seems to be almost the case at the IPCC. A small occasion for some, but important one for my graphs, at 13:48:33 (Friday, UK time) my stat counter recorded 150,000th visitor, who came from Columbia, Maryland, United States. Thanks to all who followed my graphs during last 3-4 years, and my gratitude goes to Anthony and the WUWT for the hospitality and open-mindedness, the blog the most of hits came from, followed by Tallbloke’s, Climate etc, daltonsminima, RealClimate, Chiefio, JoNova, end number of the less known blogs, where I never posted. Like the link between El Nino and solar activity, Rog. I wonder if the weaker NH polar vortex at times of low solar activity has something to do with it? 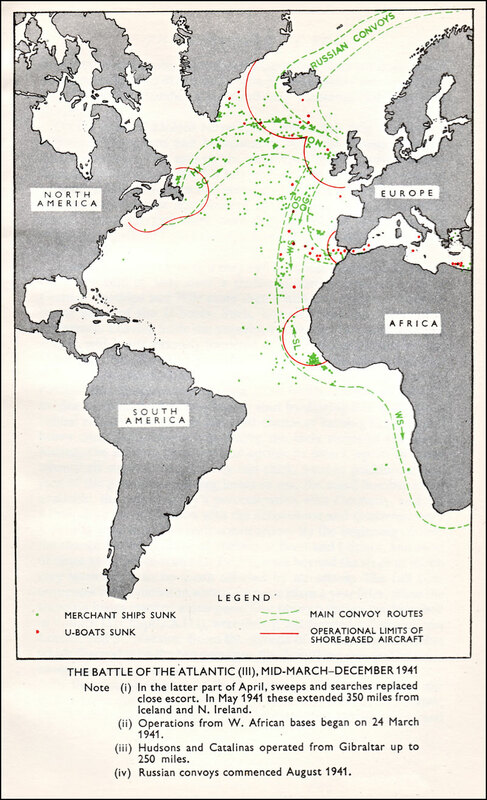 I also think that sea temp measurement during WW2 could be a bit dodgy because of the use of convoys to avoid U-boats and the the mainly northern route they followed – which was almost smack on top the Gulf Stream. Fewer geographical measuring points could easily bias the data. It is an uncompleted work, details are known only to 2 or 3 well known scientists, when work is completed I shall say more. I occasionally post the graph (now with the date stamped), since rumor is that someone else may be working on a similar project (sort of ‘vuk was here first’). Glad you included Becks CO2 curve. He updated his work (see http://www.biomind.de/realCO2/realCO2-1.htm ) to account for wind measurements from his peer reviewed paper with Prof Francis Massen “ACCURATE ESTIMATION OF CO2 BACKGROUND LEVEL FROM NEAR GROUND MEASUREMENTS AT NON-MIXED ENVIRONMENTS” which you can download from the papers page of his web site. Should have added that Becks’ website is maintained by his daughter who graciously sent me an email after I expressed my condolences. Beck was a true scientist and a man of integrity. CF and Michael Hart, thanks. Willis E very kindly ran that graph through his graph-to-data software for me so I have a series we can use going forward. I’ll make it available with the next post on the topic. Beck will be joining the greats in the talkshop hall of fame soon. The Met Office’s research into how ships measure sea water temperature and the errors that can occur is very detailed, they have put a lot of effort into it. Have they done similar reasearch such as Tim is doing into their own land based weather station measurements? Perhaps the data recorded by these fellows is a tad more accurate than some of the howlers that Tim has come across. Cool vuk. Good luck with your work. Seems like geomagnetic and solar are certainly important parts of the puzzle. Any ideas on the source of the PDO? Or do you consider it representative of Enso and not a driver. The spike in US readings also correlates almost exactly with humps/troughs in the MAT, NMAT, cloud cover, SLP and wind speed records. “(T)he climategate scientists …. needed to ‘get rid of the 1940′s hump’”. Actually they needed to keep it, because without it the 0.5C stair-step bucket/intake bias correction they had applied to HadSST2 would go away and their climate models would no longer “fit” HadCRUT3. So while they were forced into acting by Thompson’s identification of the artificial downward SST shift in 1946 (which had been obvious in the records since 1982) they couldn’t just adjust it out. What they finally did was smooth out HadSST3 so that half of the Thompson shift went away (if you look closely you’ll see that the other half is still there) and spread the bucket bias correction out over a period of 50 years. This makes HadSST3 arguably the worst example yet of data massaging in the service of AGW, but I digress. The “here” link doesn’t seem to want to work, but https://tallbloke.files.wordpress.com/2011/02/final-sst.pdf should. Roger A: Excellent, I love a good scrap. I never got to this in the OLR thread, but I suggest everyone think about resonance of solar activity with natural earth cycles — for example THE YEAR. As for what vukcevic’s doing here ( http://www.vukcevic.talktalk.net/GSC1.htm ), is it really such a mystery ed (September 28, 2012 at 2:22 pm)? That’s a simple superposition: northern geomagnetic field (GMF) summary + solar cycle. I’ve requested data access from ETH Zurich & other sources, but my requests have been ignored. Were the data on a site like KNMI Climate Explorer, we all would have had replications of vuk’s graph within no more than a few minutes …months ago! Instead, as admins do, formal restrictions are used as a mechanism to draaaaaag things out over years, if not decades. When I worked in an administrative capacity in academia, I learned very well the following craft: “Leverage the calendar”. It works like a charm. There’s a lot more to say. We won’t get to everything in one thread, so it’s good TB plans a series on the absolutely unforgivable 1940s data vandalism, which is the one and only thing from climategate that caught my attention (drawing severely harsh condemnation). There’s a (quantitatively but maybe not colloquially) simple way to look at it. I’ve outlined that in various notes here ( http://judithcurry.com/2012/09/14/national-strategy-for-advancing-climate-models/ ), linking to 3 of Jean Dickey’s articles that go over the underpinning fundamentals. Ignorant &/or deceptive mainstreamers are able to maintain the confusion about this by clinging intransigently to oldschool quantitative methods that ARE NOT DESIGNED to be able to see this — they’re literally totally blind to it. I assure everyone that 1+1 will still equal 2 whenever the mainstream gets around to looking with clear vision. But biases alone can’t account for the multivariate patterns observed. Patience is in order for those inclined to rush to anthropocentric judgement, ignoring nature’s power & beauty. Biased measurements won’t stop this from being cracked as there are global constraints from the law of conservation of angular momentum, central limit theorem, and the thermal wind relation. Not even spatiotemporal chaos can hide from them. Nothing is exempt from these universals. Are you familiar with the work of Jean Dickey (NASA JPL)? Roger A: Your 18 page pdf https://tallbloke.files.wordpress.com/2011/02/final-sst.pdf is a great piece of work everyone should peruse. Along with your pink lined plot of El Nino’s and blue lined plot of La Nina’s I have the following observations to make. Unfortunately the link at footnote 18 is no longer live, but the Queensland government list of ENSO annual events I linked in the head post quite clearly shows the strong El Nino events in the 1940’s and the dearth of La Nina’s compensating them. My opinion is that this statement doesn’t follow from the line of reasoning pursued. One of them is spurious, most likely cloud observation from a limited range being extrapolated worldwide. But I don’t think you can dismiss the others simply because they agree. 2) The pink and blue lines on your plots rob us of context. To understand the relationship of ENSO to the solar cycle, you need to look at and consider the interplay of the amplitudes of successive El Nino and La Nina and neutral phases. Your coloured bands do away with understanding and replace it with the most uninformative binary representation of the data. The weather became ripe for war? How do you explain the dozens of other variables? For example, how did the war affect annual-grain aa index? Your graph will no doubt convert many to your view. 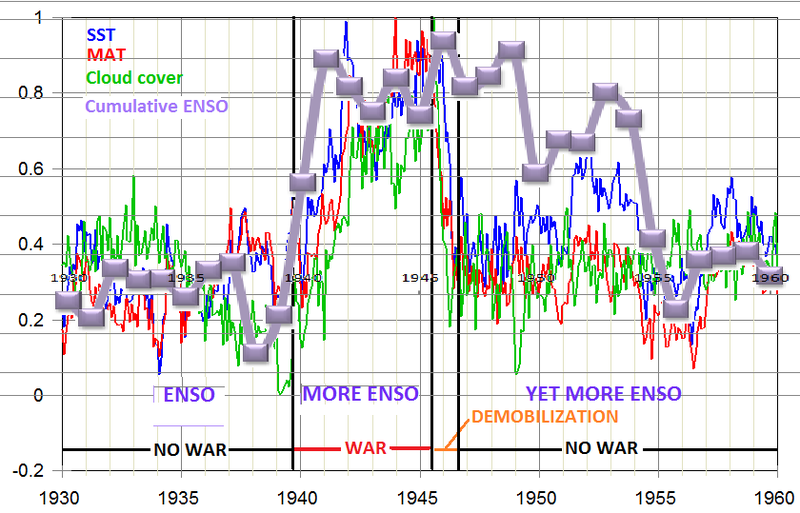 I think the cumulative ENSO curve may be telling us something about “the 1945 problem” too. unlikely to have been fiddled to cover up the ‘war effort’. Sorry to spoil the fun. And the cumulative ENSO series against Beck’s co2 plot looks ok as well. We’d need the metadata to see where the 1935-40 and 1945-50 readings were taken to see if that has a bearing on the offsets. It’s also worth remembering the US got hot in the late 30’s, so if the measurements are from there, that might help explain the higher 1935-40 levels. I think we should give the engineers and scientists of the 1930’s credit for doing a pretty good job with fitting temperature sensors to cooling water intakes on ships. I can’t imagine they made no effort to calibrate them to bucket measurements. Very nice work Vuk. Thanks for the supporting evidence. vukcevic, since tides are predictable, you should be able to extend the blue series to the right here ( http://www.vukcevic.talktalk.net/AMO-T.htm ). Regarding your north atlantic pressures: You’ll find the same thing in the North Pacific. Pressure-SST relations are already very widely known, but there are a lot of ignorant/deceptive people involved in the climate discussion, so it’s good you’re around to inform/remind. Why is there no campaign to “correct” annual-grain geomagnetic aa index? Why is there no campaign to “correct” earth rotation deceleration records? My point is: IF all wartime records suffer from anthropogenic measurement bias, that’s a MULTIVARIATE “correction” problem demanding the use of MULTIVARIATE methods. So WHY do we see only TEMPERATURE “corrections” via UNIVARIATE methods? The Hysterical Record of Solar & Climate Science…? 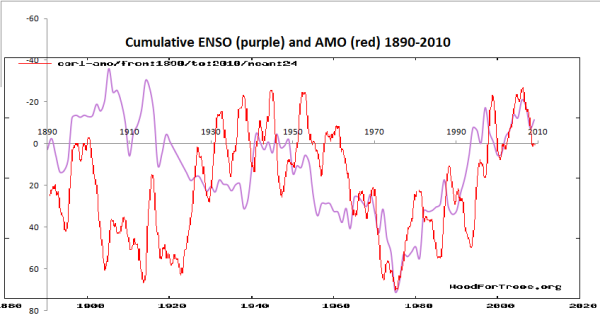 Cumulative ENSO index compared with AMO. TB, break your ENSO integral down by month. You’ll find its different seasons match different other familiar things. A couple more monkey wrenches to throw in the works. First on the impacts of ENSO. Here’s a plot of SST versus Niño3.4, which is the only ENSO index I can find that covers the WWII years now that the Bivariate ENSO index has disappeared off the web. The abrupt decrease in the number of readings after Pearl Harbor in late 1941 and after demobilization of the US Fleet in late 1945 both coincide with abrupt decreases in SST, and between these two events SST tracks the number of readings. Conclusive? No. But enough to suggest an unhealthy dependence of SST on the number of readings. Also note how few SST readings were taken during WWII (only 6,300 in December 1942). There is no way a realistic monthly SST mean for the entire globe can be calculated with such a small number of readings, particularly when all the dislocations caused by wartime conditions are factored in. Much of the WWII SST data (and the other marine data that go along with them) can be rejected on these grounds alone. I think that’s a rubbish argument. Why should less readings mean high biased readings? Also, I think the cumulative ENSO index is more informative than a straight plot of the values, for all the reasons Bob Tisdale goes into regarding the upward step changes in temperature following the big El Nino events. I think your argument is paper thin, and you are not squaring up to the multiple lines of evidence we have presented which show that SST was high in the 40s. Thanks, I will. Here’s my ENSO graph covering the same period. There was no La Nina in the 40’s worth the mention. Ongoing dustbowl conditions in the States and the high late 30’s temps are another factor to consider. Data here. Where is your data from by the way? This data covers the whole region El Nino and La Nina are classified from. Not just Nino3.4 as your data covers. The US used Fahrenheit UK uses Celsius (not sure when from) there would be conversion error and rounding errors, not unheard of in manual temperature recording. And main sea water temperature gauges have never been calibrated (to meteorological standards) nor read with any deliberate accuracy by engine room staff! both at sharp increases of wind speed. Hi Ulric. The two wind speed graphs you put up earlier show opposite trends at those dates. WUWT? Yes the scale on the first one seems to be reversed. I think it’s a Bob Tisdale one. Maybe check straight from COADS. Minor stuff out of the way first. “Why should less readings mean high biased readings?” Sometimes it does and sometimes it doesn’t. The high-bias over the wartime period as a whole is most likely a result of the increased percentage of US readings, which occurred not so much because of an increase in US readings but because of a very large decrease in the number of readings from ships of other nationalities. Between 1941 and 1945, however, there’s a direct correlation between SST and the number of readings, indicating that over this particular period more readings, not less, mean higher-biased SSTs. The two effects are superimposed. “(Y)ou are not squaring up to the multiple lines of evidence we have presented which show that SST was high in the 40s.” Well. let me now square up to them. 1. Vuk presented data to show that there was a 1940s peak in SAT and that it correlates with the AMO, which is correct. But the peak was in SAT, not SST. And unless I’ve missed something, that was it. Which leaves the three lines of evidence you present. 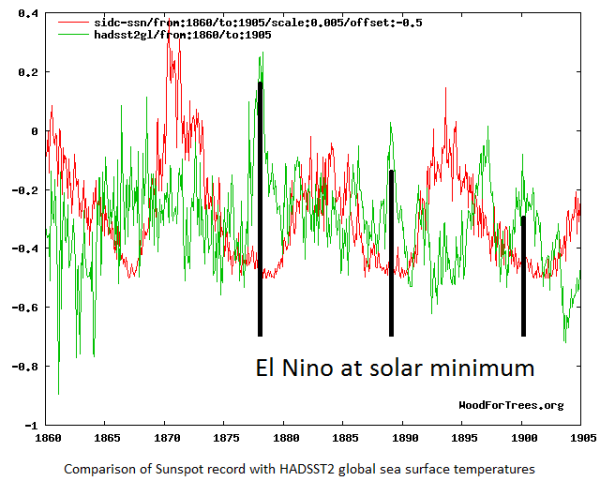 First are the El Niño at Solar Minimum plots you show in the post. I think the comparison below, which uses the Queensland Government data you use to define El Niño years, is probably more realistic. Next is the cumulative ENSO index. I don’t think accumulating the ENSO index gives a physically-meaningful result, but if it means anything at all your plot (reproduced below) suggests that the 1940s hump should have ended in 1954, not 1946. Third is Beck CO2, which is plotted against Kaplan SST on the graph Michael Hart linked to above, again reproduced below for reference. This is the problem with Internet sites! These issues were discussed, to length, on the Channel 4 ‘Eve’ web-site and the Climate Audit ‘Forum Boards’ many years ago. C4 decided to incorporate posts within the subject’s web page, so obliterated their ‘Eve’ site and SteveM closed his ‘Forum Boards’ (he never was interested in anything that went on there anyway). Besides that, I’m many computers ‘down-line’ of where we were then. As a result, we’ve lost a lot of logic and links. That’s sad, but I’ll offer my, then, immature response (perhaps it’s still immature) and say that “although ‘the war’ was from 1914-1946 (Great War and WW2), we only used RDX during WW2” (inclusion of aluminium oxide to the atmosphere). You don’t know whether there was a high bias, This is the point at issue. People who have studied it come up with a range from insignificant to the full 0.7C. Totally inconclusive IMO. Where SST goes, SAT follows. ” I think the comparison below, which uses the Queensland Government data you use to define El Niño years, is probably more realistic. Well you might find little blue markers that give no idea of amplitude or relation to neighbouring La Nina’s more realistic. I don’t. Anyway, to meet you halfway, I’ll plot the Queensland data against SSN and we’ll take a look. I think it offers a useful way of considering the effect of no La Nina’s during the 40’s on leaving SST elevated. Do we have any reason to think they are wrong? Ice cores suffer all sorts of problems with diffusion, melt and refreeze. The correlation of Beck’s data and the 40’s SST hump holes AGW below the water line. The early data is poor. What I see is the red peaks avoiding solar max, tends to match often considerable solar ativity before and after.The late chap whose name I can’t remember thought this was the case. I tend to agree. As you know I don’t like these artificial datasets such as ENSO. This I think is a good instance where we need a better measure. You really ought to be more cautious when venturing outside your area of expertise. You keep making these outlandish statements which, frankly, would subject you to ridicule in knowledgeable circles. Bart, thank you for referring to my original work. I have been explaining ocean inertia to Leif for the last four years. It’s something engineers have no problem with, but computer programmers like Leif and the other climate modellers seem to struggle on. Also, he is in denial of it when it doesn’t suit his argument, and promotes it when it does. In short, he is utterly inconsistent in this matter. Not very scientific is it? I suggest that you don’t allow him to soak up too much of your time with this kind of horse-play, I need your help on more important projects than banging you head against Leif’s wall of studied misunderstanding. The early data is poor. What I see is the red peaks avoiding solar max, tends to match often considerable solar activity before and after.The late chap whose name I can’t remember thought this was the case. I tend to agree. 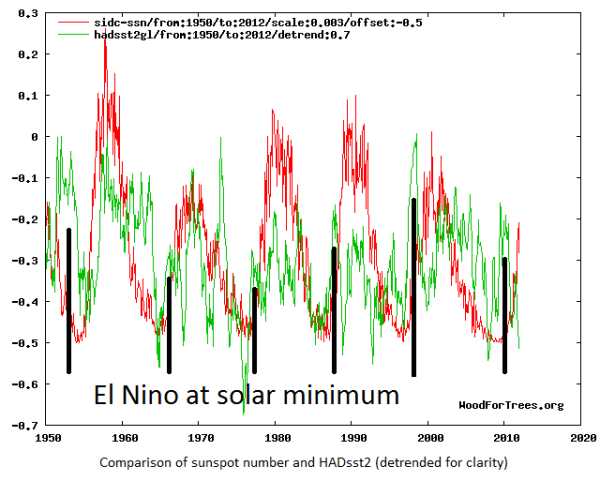 The El Nino’s tend to occur at or just following solar minimum, or otherwise on the downslope of the cycle. This is because the energy flow reverses direction and starts coming out of the ocean rather than being pushed into it by the Sun. It happens on longer timeframes too. When there has been a run of high cycles and then a reduction, for example at the end of the C19th / start of the C20th. Roger A and others SOI is a real measured value. For one month it is the difference of the sea level atmospheric pressure between Tahiti and Darwin (each averaged for the month) less the long term pressure difference divided by the standard deviation of the long term difference multiplied by 10. The pressure differences have been measured since 1876 and the whole table can be found here http://www.bom.gov.au/climate/current/soihtm1.shtml You can find links to definitions on that page. An El Nino period is recognised when the SOI is sustained at less than -8 (eg 1877 Jun -16.8, Jul -10.2, Aug -8.2 Sep -17.2 Oct -16 etc) A La Nina period is recognised when the SOI is sustained greater than +8 (eg 1955 May 13.1, Jun 16.4, Jul 19.2, Aug 14.9, Sep 14.1 Oct 15.2 etc) In north-east Australia ie Queensland above average rainfall is associated with negative SOI.- SOI figures are now given daily in the weather section of the TV news. It has been found that very high rainfall and floods occur when there is an El Nino and the IPO (Inter-decadel Pacific Oscillation) is less than -0.5. Since the 2011 Brisbane floods people in SE Qld are much more aware of SOI figures and likely rain. Looking at the table it will be seen that there was an El Nino from the end of 1939 to the beginning of 1942. This is real measured data which would have been regarded as important at the beginning of the war. Thanks CF, that’s very helpful. I need to turn the monthly data table into a single column of data from 1876. Does anyone know of a shortcut method in excel to do this? Answer: there isn’t one, but I’ve worked out how to do it. Klyashtorin, L.B. ; & Lyubushin, A.A. (2007). Cyclic Climate Changes and Fish Productivity. Government of The Russian Federation, State Committee For Fisheries of The Russian Federation, Federal State Unitary Enterprise (FSUE), Russian Federal Research Institute of Fisheries and Oceanography (VNIRO). Moscow, VNIRO Publishing. Klyashtorin, L.B. (2001). Climate change and long term fluctuations of commercial catches: the possibility of forecasting. FAO Fisheries Technical Paper No. 410, 98p., FAO (Food Agriculture Organization) of the United Nations, Rome. Will there be a campain to “correct” indian summer monsoon rainfall & japanese sea level? TB: The function you need to use in Excel is “offset”. You’ll have your table converted to a column with it in seconds. RA: The integral is physically meaningful as it indicates equator-pole gradient steepness persistence and thus cumulative meriodional transport (via western boundary winds/currents). See the work of Jean Dickey (NASA JPL) for an overview of the nuts & bolts of THERMAL WIND. Be careful not to treat all seasons as equal – (equator-pole gradient is WAY steeper in winter – see especially EAST COAST EURASIA = TOP DOG globally). [Reply] Thanks Vuk, emailed to crosscheck. The Team play a two “trick” game: “Hide the Decline” and “Hide the Incline”. They need to be “nailed” on both counts. Beck was a true scientist and a man of integrity. Totally agree… very much missed… but his work live on. Well deserved for a true GREAT. cementafriend: “Roger A and others SOI is a real measured value. For one month it is the difference of the sea level atmospheric pressure between Tahiti and Darwin (each averaged for the month) less the long term pressure difference divided by the standard deviation of the long term difference multiplied by 10.” Thanks for the clarification. So TB, the metric you’re using is the cumulative difference of the monthly average sea level atmospheric pressure between Tahiti and Darwin less the long term pressure difference divided by the standard deviation of the long term difference multiplied by 10. Incidentally, here’s a pic comparing the SOI with the Niño3.4 index. They generally show the same Niño and Niña events, but not always, and there are some large differences in amplitude. So if you factor amplitude into the equation a lot depends on which index you use. 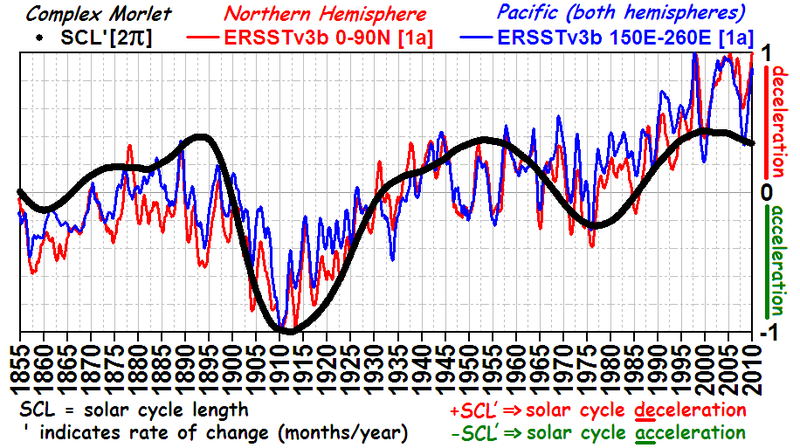 TB again: You’re trying without much success to establish a connection between solar cycles and El Niños and between El Niños and long-term SST/OHC trends. Why not just go for a direct correlation between solar and SST? Now back to the question of the SST hump. If you go to the very excellent KNMI Climate Explorer site and ask it to plot a time series you will see a box that says “demand at least 30% valid points”. I’m not sure exactly what this means, but 30% is clearly some kind of a confidence threshold that someone at KNMI thinks you shouldn’t go below if you want good data, and most series will in fact give you continuous numbers going way back if you leave the 30% unchanged. You have to go down to 5% minimum valid points to get them all. 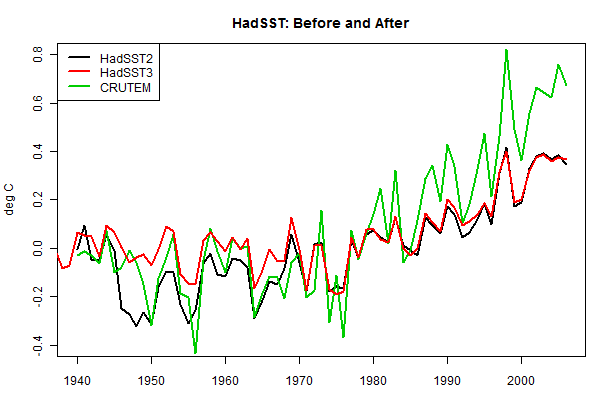 TB again: You say “Where SST goes, SAT follows.” Not true in the long-term, but true in the short-term. Which leads into the next pic, which compares detrended ICOADS SST with detrended GISS SAT. The short-term wiggles in SST and SAT track each other quite closely for most of the time but the correlation falls apart in and around the 1940s. So if the wartime SST data are good and the hump is real you now also have to explain why normal ocean-air heat transfer mechanisms ceased to operate over this period. Finally, to all those who have commented on the Beck CO2 data. The fact that the Beck hump happens to correlate – kind of – with the WWI SST hump doesn’t necessarily make either of them right. Monthly data makes a big difference to the plot. Big thanks to Vuk for help with formatting. I’ve added sunspot numbers for fun and interest. Anyone who wants a copy should grab it quick before Vuk removes it. Thanks again Vuk. I’ve displayed the plot with negative SOI at the top because that is the warm ‘El Nino’ effect. I think it more natural to read it this way, but people should be aware that Vuk’s and Archibald’s plots of SOI run the other way up. What interests me is the way ENSO runs warm when the cycles are low, and decreases as the Sun Strengthens, then strengthens aagin as the Sun remains strong, but the peak amplitudes start to fall. This appears to confirm my contention that energy comes out of the ocean when the Sun is weaker on the multidecadal scale as well as at the decadal scale with individual cycles. Hopefully, that’ll make Roger A sit up and take note. The 1940’s were just after a run of weaker cycles, but just as the Sun started getting stronger again. Double whammy EL Nino plus stronger Sun. The lag in the system means we get some more extreme decades at trend crossover points. This is why the professional climatologits have come to the mistaken conclusion that the Sun has little effect on climate. Enso acts as a (laggy) negative feedback to solar input. The good news is that it might not get as cold as we have been fearing, if the heat built up in the ocean over the years of the high solar cycles continues to be released while the Sun is quiet. I suspect though, that while coastal areas and Islands will stay relatively warm (or at least, not too much colder), some severe winters and late springs are on their way for the interiors of big continents. Bad news for crop production in Canada and Russia, as Archibald has pointed out before. There is not a lot of information with the listing, apart from classifying them by their effects on rainfall in Australia, which is of interest here. They have one in 1925-26, but none in 1934. Thanks Geoff. I note they say the 40-41 event was strong and the 41-42 event medium strong. It does appear to take about half a solar cycle for the extra warmth injected into the oceans during solar max to start coming out again hence the tendency for El Ninos to be stronger during solar minimum. If that is a persistent phenomenon then it produces a much better short term link between solar variability and ENSO that I anticipated. My work has been based on the longer term multidecadal and centennial timescales but if the relationship also turns up withing single solar cycles then so much the better. That would appear to be a larger scale phenomenon than the single cycle scenario. Due to the effect of the thermal inertia of the oceans energy will continue coming out of the oceans for some time after the energy going into the oceans has begun to decline which must result in a net cooling overall after a while. However I think it is a transitional process rather than a sign that a quiet sun always accompanies more El Ninos. During the late 20th century the sun was pretty active and for most of the time the El Nino events were strong and lengthy. Now the sun is less active and El Nino events appear to be getting weaker. Have you tried integrating internal ocean cycles with the solar cycles such that at some times they are in phase supplementing one another and at other times out of phase offsetting one another ? 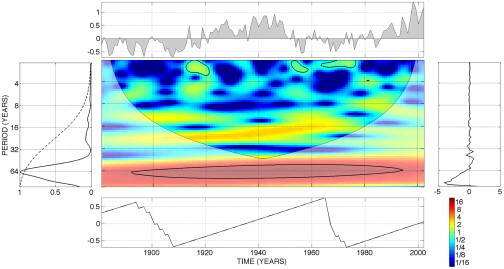 Over the 500 year timescale from MWP to LIA or LIA to date the sun / ocean phasing issue gets smoothed out but on shorter time scales that phasing issue results in lots of failures of correlation. Vuk, you are a star, thank you. OK, here’s where I’m up to with the model. Looks like the estimates of SST having a measurement bias of around 0.15C in the war years might be right. Too early to tell, more work needed. AMO is very specific: the temperatures go up or down across whole of the N. Atlantic almost synchronously, while I think in the north Pacific there is an east-west seesaw which is out of sync with AMO. What S. Atlantic, S. Pacific, Indian and Southern ocean do, I am not certain. In addition there is circumpolar temperature SST wave south of 50ish S degrees. I think it could be misleading to add together N & S Atlantic, N & S Pacific, Indian, Southern and Arctic Oceans. Thanks Vuk. There’s no doubt my model is oversimplified, but it does seem to be capturing the excursions in global SST reasonably well. More work needed, but for a 3 parameter model, it’s not bad. Right, graph updated, must go. One of the topics raised by the post was World War II adjustments. About a year and a half ago, I started a post but never got around to finishing it. It included an animation of the HADSST2 SST anomalies for 1939 through 1947, using maps of 12-month average data to reduce the seasonal component and weather noise. One of the periods that looked very odd was the boreal winter of 1943/44. Example: the 12-month period, ending in June 1944. There appears to be a strong La Niña pattern. The SPCZ and KOE have relatively high positive anomalies. The only thing missing is the strongly depressed SST anomalies in the cold tongue. It looks like there’s a cold spot in the eastern equatorial Pacific, about 120W, but I would expect a stronger signal in the NINO3.4 region with the SPCZ that high. Are we missing a La Niña in the equatorial Pacific data around that time? John Kennedy’s reply is directly below it. Bob, many thanks for this comment. It’s very instructive to see where chunks of data are missing in the Pacific. I’ll get back to this once I return from the Royal Society meeting I’m attending. Bob’s animation is useful — appreciated. Soon, W.; Dutta, K.; Legates, D.R. ; Velasco, V.; & Zhang, W (2011). Variation in surface air temperature of China during the 20th century. Journal of Atmospheric and Solar-Terrestrial Physics 73, 2331-2344. In relation to the latter, it’s worth noting that harmonics of 64 years hit all of the dominant higher frequency periodicities between 1 & 32 years. A collection of dominants hit odd phase at 32 years and even phase at 64 years. This demands very careful investigation with an eye towards changing solar cycle length, changing Chandler wobble frequency, & resonance optimization. While I was at the Royal Society meet this week, Peter Webster told me about some old COADS data he has which will help me calibrate pre-1917 sea surface temperatures. This could be interesting, because if I add 0.25C to all HADsst2GL temps prior to may 1917, my model and the dataset matches almost perfectly. OK, the model is looking pretty good. And it’s looking like Roger A was right.